Do the right thing! Pay it forward. Together, let’s make a positive difference. ← Do Greed and Fear Cause Your Investment Decisions Cost you Profits or Losses? Click for Video Intro of The Project Life Series: Key Enablers audio and video book available now. 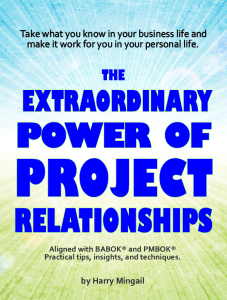 The Extraordinary Power of Project Relationships (click to buy for iPad, Kindle, and your favourite eBook retailer) is packed with great ideas, techniques and many checklists to make great things happen for you. At minimum you will find something and typically many things which will reward your investment in this book, with better relationships. Great relationships will generate monetary as well as a flood of other positive differences in your life. Your life is worth it! Enter your email address to follow Harry's blog and receive notifications of new posts by email. MSNBC’s Mika is a BIGOT.